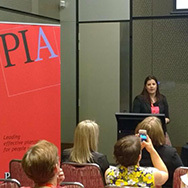 Last week, Senior Planner and Bushfire Planning Specialist, Laura Gannon, presented a paper at the 2014 PIA QLD State Conference on developing a robust policy framework for bushfire hazard planning. ‘Placing People in the Landscape: Towards a robust policy for bushfire hazard planning in Queensland’ analyses the current policy approach relevant to Queensland with respect to State and local government planning instruments which relate to bushfire hazard. The paper also explores the notion of ‘responsive bushfire planning’ and how it can underpin the various tiers of the current policy framework and contribute toward building community resilience. Interested in reading the full paper? Click here to download. Jensen Bowers offers a range of bushfire strategic planning and management services. To find out more, click here.